Real Kashmir defeated Mohun Bagan 1-2 at the Salt Lake stadium in Kolkata on Sunday 6th January, avenging their previous 1-0 loss. Mason Robertson drew first blood for the Srinagar-based side in the 33rd minute after heading in Surchandra Singh's brilliant cross from the right wing. 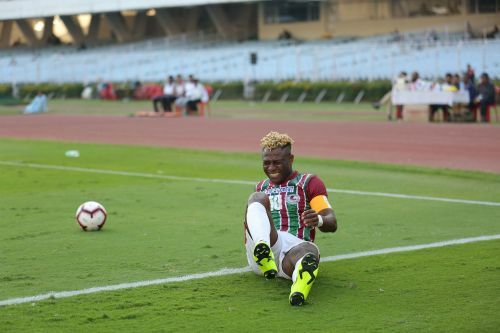 Sony Norde levelled things up for Mohun Bagan just before the half-time whistle as his curling free-kick from the edge of the penalty box left the rival goalkeeper flabbergasted. The Mariners blazed all their guns to score the winner, however, the Snow Leopards caught them off-guard. Mason Robertson did a brilliant one-two with Kofi Tetteh and his ensuing shot bulged into the back of the net after striking the inside of the post in the 73rd minute. Mohun Bagan tried their best to find the equalizer but Real Kashmir's shift to a defensive 5-4-1 formation dented the Mariners' plans. The game finished 2-1 as Real Kashmir climbed to the third spot in the table only behind league leaders Chennai City FC and NEROCA on a head-to-head count. Mohun Bagan, on the other hand, is still languishing on the sixth spot with 15 points from 11 matches. I-League's rule of fielding at least one player below the age of 22 meant SK Faiaz didn't get a place in the starting line-up. Lalramzuava Khiangte was made the scapegoat as he was taken off the field in the 28th minute. SK Faiaz's introduction injected the attacking impetus from the right side of the wing, reducing the burden from the shoulders of Sony Norde as the attacks were coming from the left wing alone. However, if he had started the game, Real Kashmir would have been on the back foot from the opening whistle itself. Not having a promising U-23 player in the squad is hampering Mohun Bagan's title aspirations immensely.